Saul was not going to be king of Israel anymore. He had disobeyed God. Israel needed a new king, a better king. God told Samuel to visit a man in Bethlehem named Jesse. Jesse had eight sons, and one of them would be Israel’s king. Samuel did what God told him to do. He went to Bethlehem to meet with Jesse and his sons. Jesse’s oldest son, Eliab, was tall and handsome. “This must be the one God chose to be king,” Samuel thought. One by one, Jesse’s sons approached Samuel, but God had not chosen any of them. “Do you have any more sons?” Samuel asked. Samuel poured oil on David’s head and the Spirit of the Lord was with David. Then Samuel went back home. The Spirit of the Lord was not with Saul anymore. In fact, Saul was bothered by an evil spirit. Saul’s servants suggested Saul find someone who could play the harp. Hearing beautiful music might make Saul feel better when the evil spirit bothered him. One of Saul’s officials knew just the person to play the harp—David, son of Jesse. 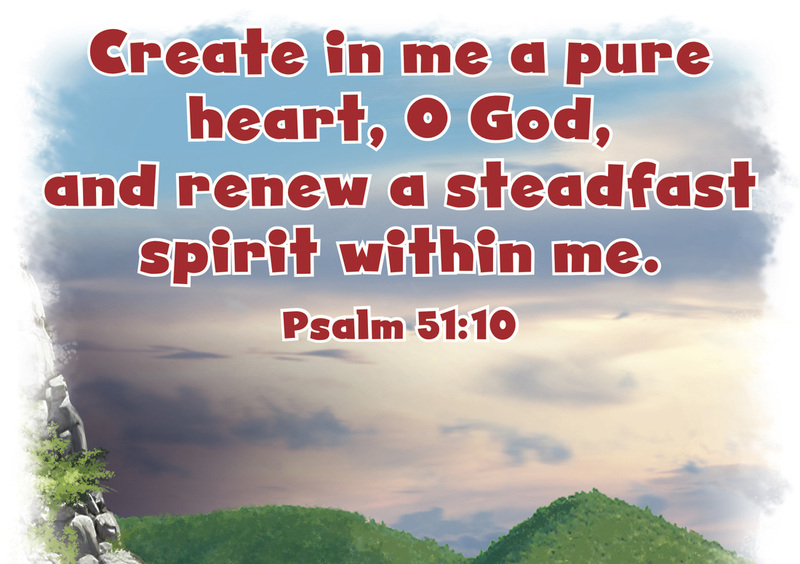 David came to Saul and whenever Saul felt troubled, David played his harp and Saul felt better. At this time, Israel’s enemies, the Philistines, got ready for war. They were going to attack a town in Judah. King Saul got his army ready to fight. The Israelites camped on one hill while the Philistines camped on another. There was a valley between them. The Philistines had a great warrior named Goliath. At 9 feet 9 ​inches tall, Goliath was their hero. Goliath shouted at the Israelites, “Why are you lined up, ready for battle? Send me your best man, and we’ll fight one-on-one.” But none of the Israelites wanted to fight Goliath. They were afraid of him. a hill. Jesse sent David to check on his brothers and to give them something to eat. David saw Goliath and watched the Israelites run away in fear. David heard that Saul had offered a great reward to the man who killed Goliath, and David volunteered to fight. 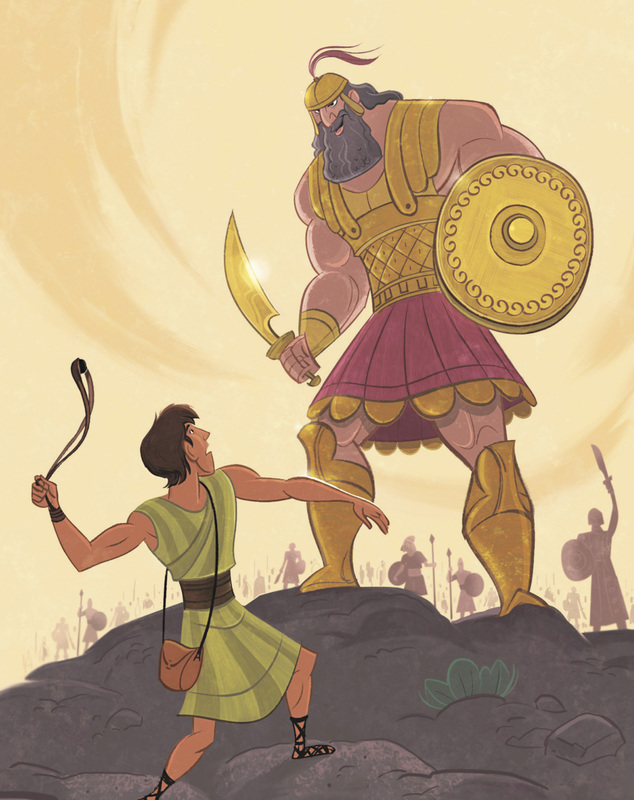 “You don’t stand a chance against Goliath,” Saul argued. Saul allowed David to fight Goliath. He offered his armor to David, but David could hardly move. He took off the armor and chose five smooth stones from a nearby stream. David was armed only with the stones and a slingshot. Goliath saw David and made fun of him because he was just a boy. David ran toward Goliath. He slung a rock at Goliath, and the rock hit Goliath in the forehead. Goliath fell facedown, and David killed him without even having a sword. Christ Connection: The Israelites were up against their toughest enemies, the Philistines. They didn’t stand a chance against Goliath, the mighty Philistine warrior. 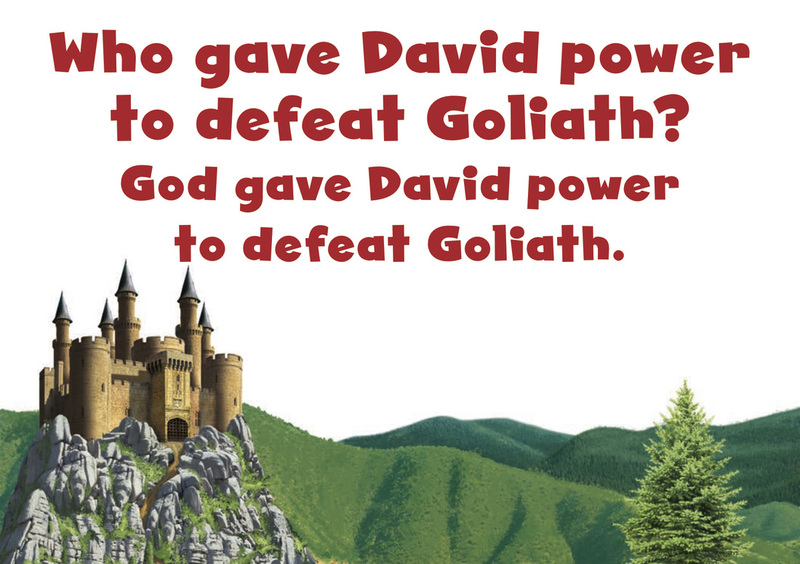 God gave David power to defeat Goliath. David reminds us of Jesus, who came to save us from our greatest enemies: sin and death. Jesus, the ultimate hero, gives us salvation and eternal life.